Cricket Australia has cancelled pyrotechnics at Friday's Twenty20 international against South Africa after an incident in the opening match involving captain Aaron Finch. 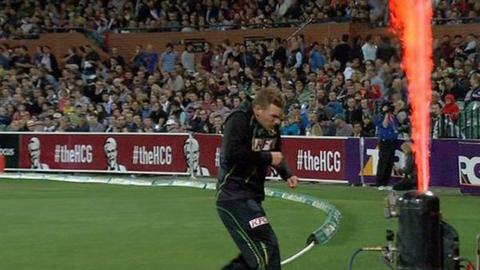 Finch was retrieving a ball on the boundary when a flamethrower went off in front of his face. CA's Mike McKenna told news agency AFP that flame units would not be used "until such time as we're satisfied that there won't be a repeat incident". The body has also apologised to Finch. The flame units, positioned between the boundary rope and the advertising boards, are used at T20 matches to celebrate wickets and boundaries. On the pitch, Australia struggled as they mustered just 144-6 in the first T20, losing by seven wickets.